Naples, Fla. (September 18, 2015) – Traditionally a tepid month for REALTORS®, August delivered robust activity in many areas of Naples particularly in South Naples, according to the August 2015 Market Report released by the Naples Area Board of REALTORS® (NABOR®), which tracks home listings and sales within Collier County (excluding Marco Island). South Naples is defined in the Southwest Florida MLS as encompassing properties in zip codes 34112 and 34113 (i.e., neighborhoods south of Davis Boulevard, west of SR/CR 951, east of the U.S. 41 and 5th Ave. S. intersection. Some of the larger neighborhoods in this area include, Lely, Treviso Bay, Isles of Collier Preserve, Lakewood, Kings Lake, Eagle Creek, and Isle of Capri). This particular geographic area experienced the highest increases in overall pending sales, closed sales and median closed prices of all geographic area reported in August. Despite a 5 percent decrease in overall inventory for homes in the South Naples region from 575 homes in August 2014 to 547 homes in August 2015, broker analysts agree that the South Naples market is gaining in popularity as buyers are attracted to its investment potential and renewed growth. Pending sales (homes under contract) in South Naples jumped 26 percent from 112 pending sales in August 2014 to 141 pending sales in August 2015. Closed sales in this region increased 9 percent from 1,482 closed sales in the 12-months ending August 2014 to 1,610 closed sales in the 12-months ending August 2015. Interestingly, the median home price in South Naples experienced the highest increase of all geographic areas with a 21 percent increase from $179,000 in the 12-months ending August 2014 to $217,000 in the 12-months ending August 2015 despite the fact that inventory decreased only 5 percent from August 2014 to August 2015. Activity in the upper end of the market was impressive in August too, as evidenced in the report. Overall pending sales for homes in the $2 million and above price category increased 58 percent from 19 pending sales in August 2014 to 30 pending sales in August 2015. This $2 million and above price bracket’s overall median closed price also increased 14 percent from $2,850,000 in the 12-months ending August 2014 to $3,250,000 in the 12-months ending August 2015. 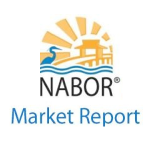 The NABOR® August 2015 Market Report provides comparisons of single-family home and condominium sales (via the Southwest Florida MLS), price ranges, and geographic segmentation and includes an overall market summary. • Overall pending sales increased 2 percent from 795 in August 2014 to 811 in August 2015. • Overall closed sales increased 2 percent from 9,695 in the 12-months ending August 2014 to 9,870 in the 12-months ending August 2015. • Overall median closed price increased 14 percent from $260,000 in the 12-months ending August 2014 to $297,000 in the 12-months ending August 2015. • Overall median closed price for homes $300,000 and under increased 10 percent from $175,000 in the 12-months ending August 2014 to $192,000 in the 12-months ending August 2015. • Overall inventory decreased 2 percent from 3,579 in August 2014 to 3,525 in August 2015. • Overall inventory for homes $300,000 and under decreased 26 percent from 1,279 in August 2014 to 946 in August 2015. • There is a 4.27 months supply of inventory. • Average days on market decreased 4 percent from 81 days to 78 days. Sellers in all geographic areas of Naples benefit when they partner with a REALTOR® who can provide an accurate market price for their home.